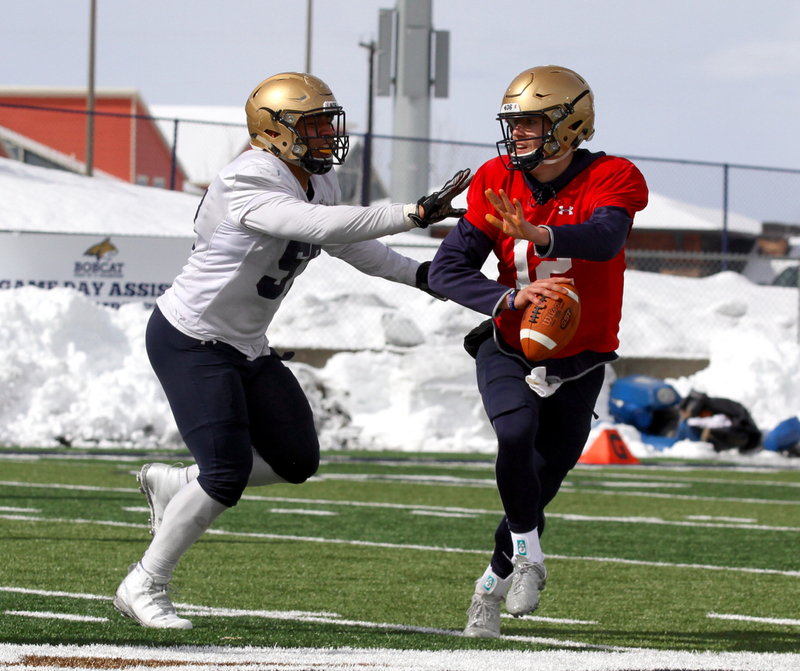 BOZEMAN — The mounds of snow piled up along the outside of the stadium lines around the entire perimeter of Bobcat Stadium surrounded a wet field with tough visibility for the players between the white lines on Saturday morning. 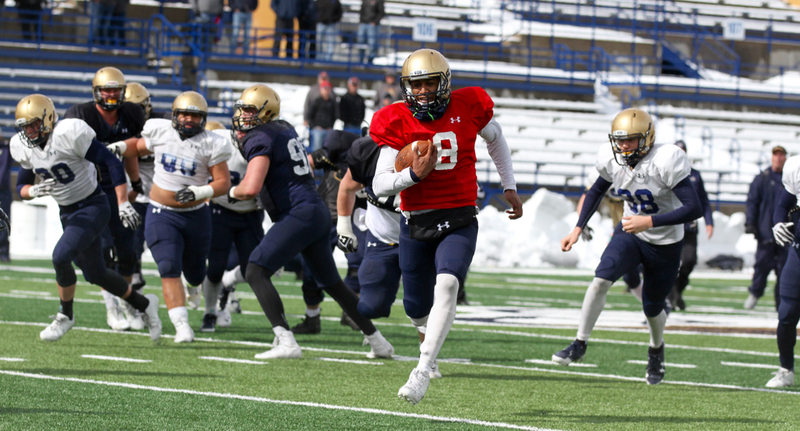 Montana State capped its second week of spring football a week after returning from spring break with its first scrimmage of the five-week, 15-practice session. Players were greeted with driving snow, wind and chilly conditions. During seven-on-seven, quarterbacks Chris Murray and Tucker Rovig both threw passes into the stadium turf. By the end of the two and a half hour session, the temperatures rose almost 20 degrees, the snow and overcast was replaced by sunshine and, for moments, a few of MSU’s biggest weaknesses in 2017 looked like bright spots. When the Bobcat starting offense got possessions off with positive plays, avoided penalties and gave themselves a chance to push the tempo, Murray and the young group around him looked efficient, explosive and dangerous. But second and third downs with long yardage needed or possessions derailed by penalties or dropped passes made Murray’s unit look stagnant. And when Rovig took his turn against Montana State’s first-team defense, he had no chance, at one point getting sacked four times in five plays due in part because he hung on to the ball so long. Murray, MSU’s electric but inconsistent junior quarterback, completed seven of his first 10 passes, one series against MSU’s backup defense and the other against the starters, including touchdowns of 15 and 24 yards to junior Kevin Kassis. When the offense gained positive yardage early in possessions, Murray’s unit whizzed down the field, showing the chemistry between he and Kassis, the power of portly running back transfer Tyler Natee and the potential danger of two young weapons on Coy Steel and Willie Patterson out of the slot. When the defense forced minimal or negative gains early, the offense sputtered, particular in the clutch (two-minute offense) portion of the scrimmage in which the starting defense forced two straight turnovers on downs. Murray was hot early, shaking off a dropped pass by speedy sophomore outside receiver Lance McCutcheon on third down that caused a turnover on downs. 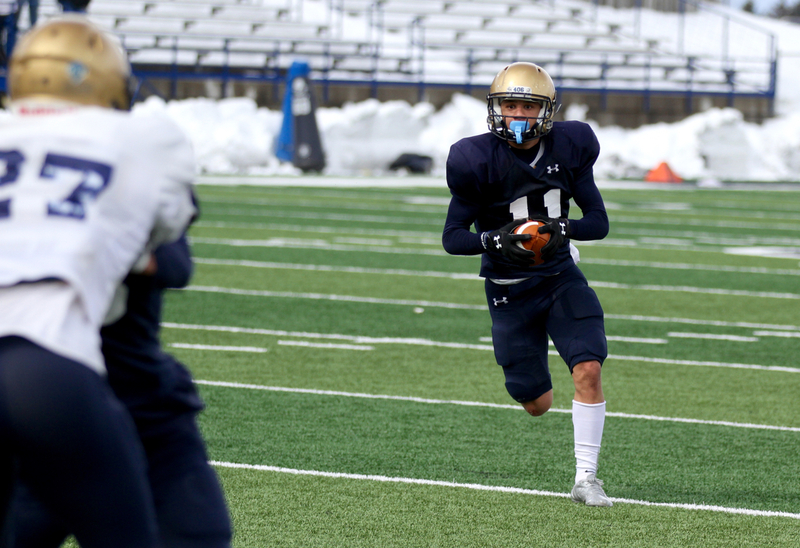 On his second possession, Murray engineered a 70-yard drive that included a 19-yard Murray run two plays before the 6-foot-3 junior showed great touch on the 15-yard scoring strike to Kassis. On his third possession, Murray hit running back Karl Tucker II, a converted receiver, on a swing pass that Tucker turned into a 33-yard gain. 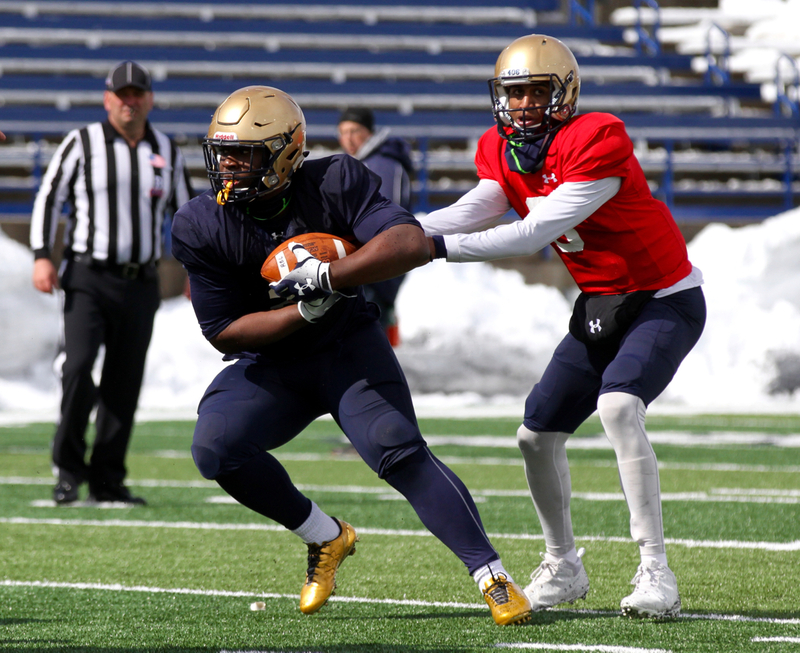 After a few runs by the 270-pound Natee, a junior who played two seasons at Indiana, Murray again showed good touch on the 24-yard scoring strike to his classmate. Rovig’s first two series’ included three incompletions and a touch sack by sophomore outside linebacker Chad Kanow. On the third series, the 6-foot-5 redshirt freshman from Boise went against MSU’s No. 1 defense surrounded by the No. 1 offensive personnel. After completing his first pass to Patterson, he was sacked three straight times, including twice in a row by fired up senior defensive end Tyrone Fa’anono. 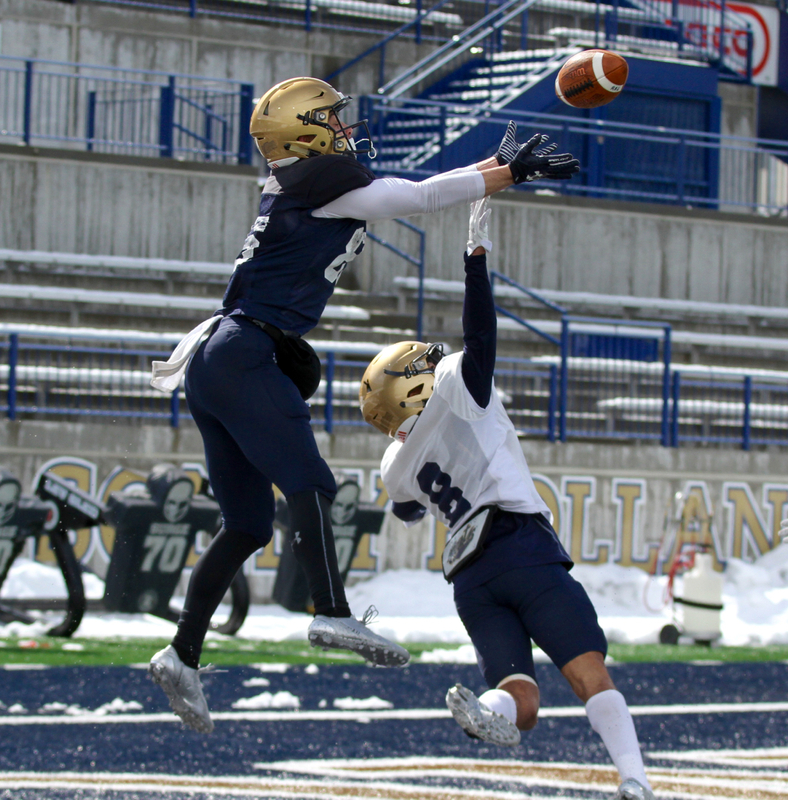 Montana State’s defense notched nine sacks Saturday, including seven on Rovig. Sophomore outside linebacker Troy Andersen and senior defensive tackle Zach Wright tagged Murray behind the line. Fa’anono and walk-on defensive end Bryce Barker, formerly a walk-on at Utah State, each tagged Rovig twice, while Kanow, junior Bryce Sterk and sophomore Kyle Finch each reached MSU’s backup quarterback as well. 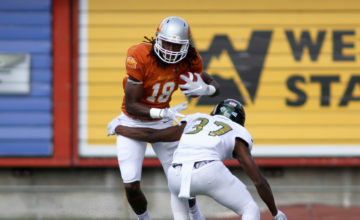 Rovig found success during the red-zone period of the scrimmage, lofting a pass to Steel for a 25-yard touchdown exactly one play after Steel scored a 25-yard rushing TD on a fly sweep play. 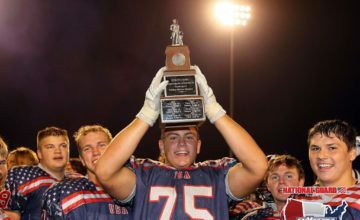 The 5-foot-9, 175-pound Steel was part of two Wyoming state championship teams at Sheridan High, earning Wyoming Gatorade Player of the Year honors as a senior. 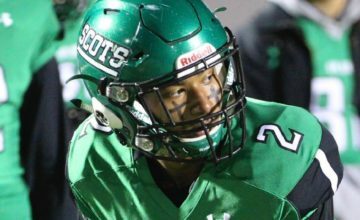 He joined MSU as a preferred walk-on last fall. 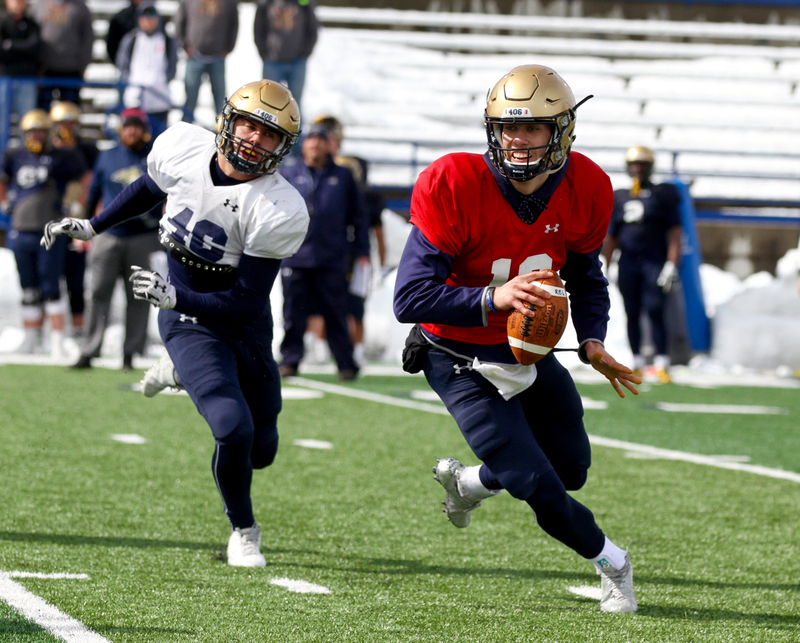 He has shown good speed, shiftiness, strong hands and an ability to contribute in the kicking game during his first set of spring drills. When Natee pounds the middle on the dive element of the spread triple option and either Steel or Patterson — a similarly built 5-foot-9, 180-pound shifty redshirt freshman — running jet sweep actions, it gives MSU an element of the run game that should have defenders heads’ spinning even more. Patterson scored an 11-yard touchdown on a pitch speed option play and totaled 15 yards on the ground to go with two catches for 10 yards. Tucker also showed his diverse skill set by rushing three times for 24 yards and had the 33-yard catch. During the final goal line session between the first teams, Murray rolled from the right hash all the way outside the left hash, stopped on a dime, spun around and sprinted all the way to the right pylon for a vintage six-yard touchdown. He finished the day 11 of 20 for 115 yards passing and 28 yards rushing, although he was tagged down for losses four times, twice in passing plays, twice on running plays. 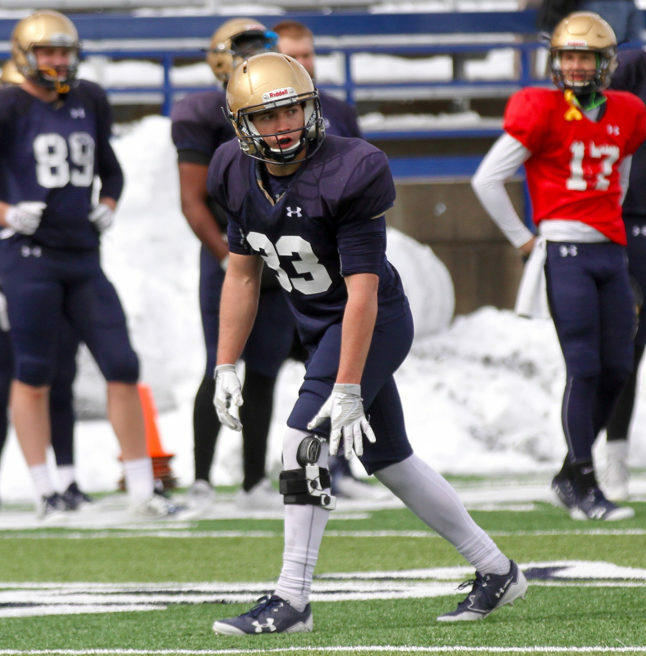 He found Kassis six times for 66 yards as well as hitting Patterson, Tucker, senior tight end Connor Sullivan and McCutcheon each caught Murray tosses. The action portion of the scrimmage ended with Tristan Bailey, a kicker from Coffeyville Junior College who played at Wyoming in 2016, trying a pair of 45-yard field goals that missed wide left and a 35-yard field goal that missed wide right. Bailey drilled a 37-yarder on his first attempt with plenty of room to spare but then was just short on a 47-yarder on his second try. 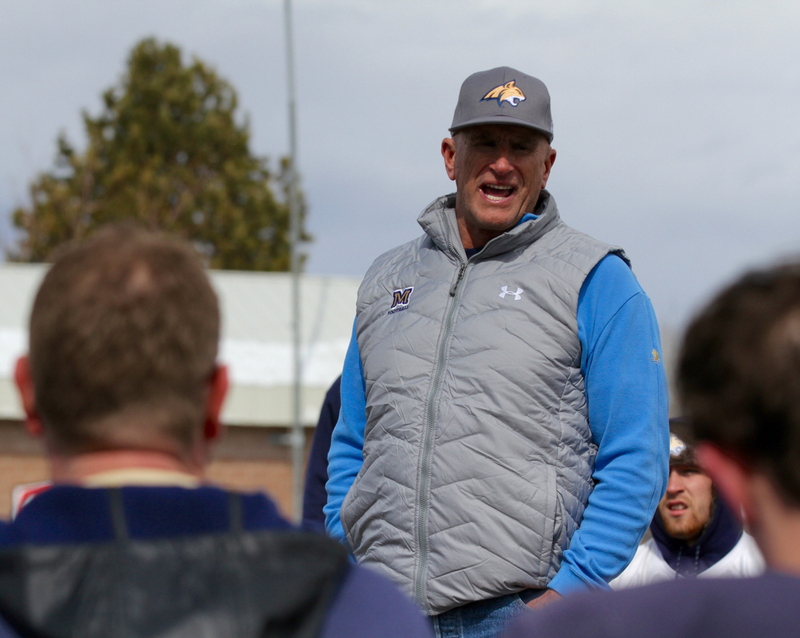 With the sun all of a sudden shining and observers shedding layers, Bill Kollar addressed the Bobcats. The MSU Hall of Famer and current defensive line coach for the Denver Broncos is one of four former Bobcats with his number retired. He is one of three first-round draft picks ever out of the Big Sky Conference before an eight-year NFL career that preceded almost 30 years working with some of the best defensive linemen in the NFL. Kollar praised the Bobcats for their energy and effort, something that Choate echoed. Receiving — Connor Sullivan 1-1; Wilson Brott 1-5; Kevin Kassis 6-66, 2 TD; Willie Patterson 2-10; Karl Tucker 1-33; Kapili Livingston-Lopez 1-3; Lance McCutcheon 1-5; Coy Steel 1-25, TD. Sacks — Chad Kanow; Bryce Barker (2),Tyrone Fa’anono (2), Zach Wright, Bryce Sterk, Troy Andersen, Kyle Finch. Tackles for loss — Elu Leota, No. 45, Tucker Yates. Field goals — Tristan Bailey good from 37, missed four other attempts.